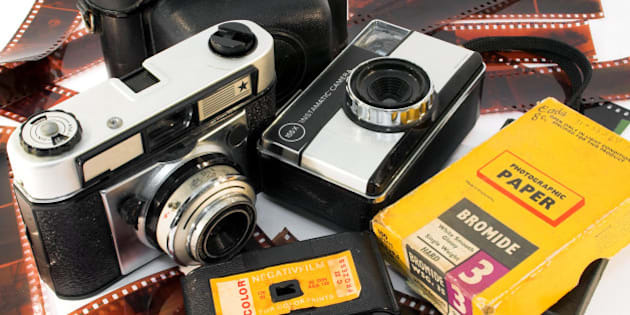 Kodak was in the business of capturing memories and their particular method was film. Then, the unthinkable happened: a giant fell. A similar story is now unfolding in the energy sector. The quicker we acknowledge the reality of climate change and unburnable carbon, the sooner we'll innovate and develop low carbon solutions to export to others. When my Dad was my age, Kodak had 90 per cent of the market share for photography in the U.S. It was a giant in the sector. To suggest that it would fall would be unthinkable yet, not too long ago, it declared bankruptcy. I recently gave a talk to elementary school students who had never even heard of the company. As unimaginable as it might be today, Exxon, Shell, and BP are now destined to face a similar fate. It's a simple story: Kodak was in the business of capturing memories and their particular method was film. As digital photography began to emerge, Kodak failed to adjust to a market shift. At the time, the technology was expensive, the images were pixellated, and storage capacity was limited. 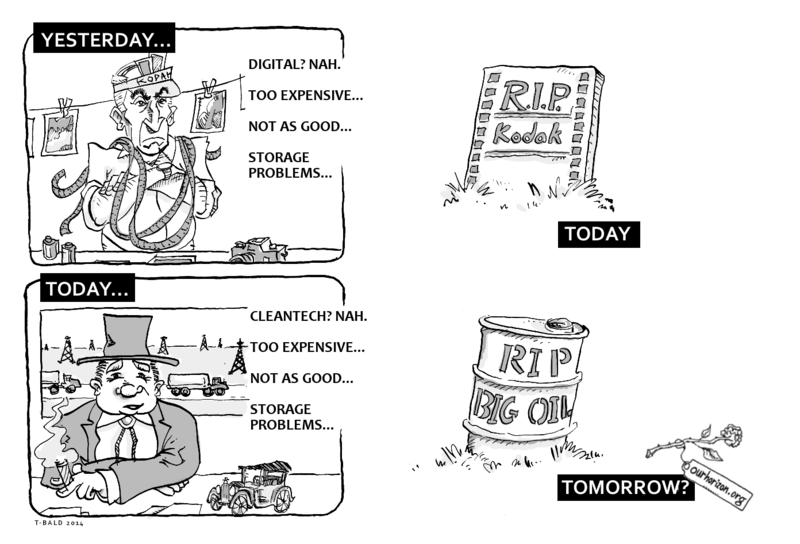 Kodak was dismissive of the emerging technology and failed to invest in it. Perhaps the organization's historic and cultural understanding of photography as film was too strong to overcome. Then, the unthinkable happened: a giant fell. As Bill Clinton once observed, "The price of doing the same old thing is far higher than the price of change." A similar story is now unfolding in the energy sector. 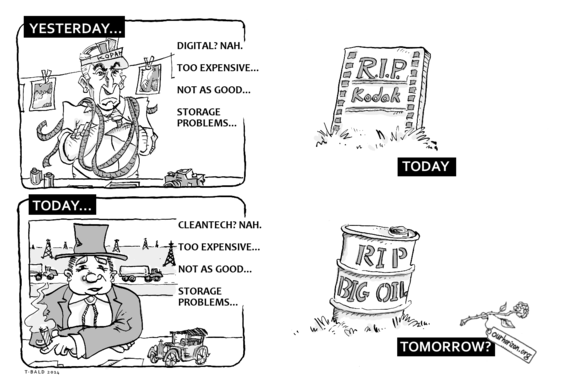 Exxon, Shell, and BP are in the business of producing and delivering energy; their particular method is fossil fuels. Today, this energy source makes up roughly 80 per cent of global supply. But a market shift is afoot in this industry; in fact, solar is expected to reach grid parity in the U.S. in 2016. In spite of this, these businesses remain dismissive of emerging technologies that they claim are expensive, lack comparable performance, and suffer storage challenges. Sound familiar? Perhaps the sector's historic and cultural understanding of energy as fossil fuels will be too strong to overcome. The decisions these giants make today will determine whether they adapt or fall. When governments committed to preventing a two degree Celsius temperature increase, they effectively created a global carbon budget. The implication for fossil fuels is that the vast majority of reserves may never be developed. Mark Carney, economist and former Governor of the Bank of Canada, concludes "the vast majority of reserves are unburnable" and refers to them as "stranded assets." Stranded assets. Like the warehouses I imagine with shelves full of dusty film canisters and other Kodak inventory that never made it to market. The fossil fuel industry can avoid a similar fate if they recognize that they are ultimately energy companies and decide to adapt to the inevitable low carbon future by investing in clean technologies. Unfortunately, senior management at fossil fuel companies are doubling down on a business model that has no future and they are jeopardizing the livelihood of their employees in the process. The U.S. and China just announced a historic agreement on carbon emissions and momentum is now building to a massive international climate agreement next year in Paris. Ontario's premier recently went on a trade mission to China where she encountered a market of 1.3-billion people looking for solutions to air pollution and climate change. It doesn't take a genius to see the tremendous market opportunity. It's like there's a canon on the other side of the planet that's loaded with money and ready to fire in our direction. Instead, that money canon will be pointed at places like Germany, Denmark, and Norway, while Canada will be left going door-to-door, peddling products that no one wants since we lacked the foresight to invest in sustainable solutions. To paraphrase Wayne Gretzky: we're skating to where the puck has been, not where it's going to be. While climate change discourse in Canada tends to focus on points of extraction (e.g. oil sands, offshore drilling) or means of transportation (e.g. pipelines, shipping), it seems that no one is asking the simple question: "How do we use the product?" This is unfortunate since the vast majority of greenhouse gas emissions actually come from end-use; emissions from extraction and processing pale in comparison to emissions from vehicle combustion. I suspect we prefer to point upstream and distance ourselves from climate change because the reality of being implicated in the problem makes us uncomfortable. But a little bit of discomfort is a good thing. Complacent markets don't innovate. In fact, the auto sector has been stagnant for over a century; many cars on the road today get the exact same fuel economy as the Ford Model T did when it first came off the assembly line in 1908. Perhaps our greatest challenges are inertia, habit, and our collective failure to question the status quo. By de-normalizing the otherwise habitual, unquestioning act of filling up a tank of gas, Our Horizon's proposal for climate change warning labels on gas pumps stimulates broader demand for alternatives. People sometimes object to the proposal by saying, "But what are people supposed to do when they see the labels? They'll only be frustrated by a lack of alternatives." But that's precisely the idea. I am sometimes told that all we need to do is offer people fuel efficient vehicles, better public transit, and various environmentally-friendly alternatives. They say, "If you build it, they will come." But why haven't we built it yet? I think we're missing a step. I say, "If they want it, you will build it, and then they will come." The labels help to create a social environment that favours reform. While some may initially perceive our labels as a threat to industry, they are ultimately about building a competitive advantage and securing Canadian jobs. We're in the early stages of a global transition to renewable energy and clean technology. The quicker we acknowledge the reality of climate change and unburnable carbon, the sooner we'll innovate and develop low carbon solutions to export to others. The longer we deny and delay the inevitable, the more likely we'll be importing solutions from others who were more proactive. In the end, a vote for the warning labels is a vote for a strong, stable future for Canadian communities. When deliberating over the idea, decision-makers will have to weigh short-term political expediency against long-term economic prosperity.